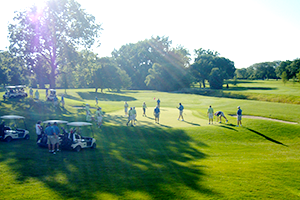 A variety of leagues and tournaments are active throughout the golf season. Men's League — Tuesdays at 6:00 p.m. shotgun start, match play format. Twenty-four two-man teams are divided into divisions by combined team handicap. Each week teams will compete in match play. Senior's League — Mondays at 1:00 p.m. and Thursdays at 9:30 a.m. Variety of events. Ladies' League — Monday at 6:00 p.m. match play format with two-woman teams. Sundowners — Monday at 6:00 p.m. shotgun. To become a member and join a league, fill out a membership application.